Jose Ramirez III (the striking Cedar instrument pictured in the middle), Marcelino Lopez (left) and Paulino Bernabe (right). Three great guitars newly added to the site! 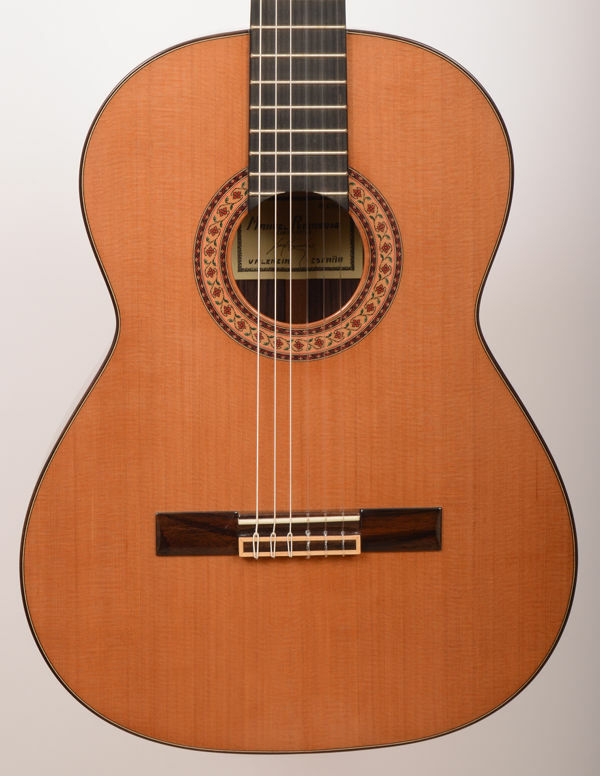 The 146c is one of Raimundo’s most popular models – all-solid woods with nice volume and sustain – and we now have it in stock with a slightly smaller scale of 64 cm. We have an excellent range of smaller guitars to try if full-size does not suit. For more details, see the ‘Smaller Models’ section from the ‘Online Catalogue’ drop-down menu. We always have a lot more instruments in stock than listed on the site though, and second-hand ones often come and go without our having time to add them. Do give us a ring or call in if you are looking for any guitar in particular – we may have something to suit! 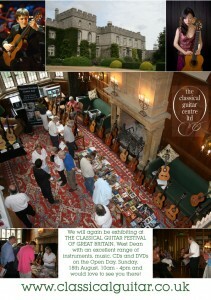 We’ll be at The 22nd Classical Guitar Festival of Great Britain in August! The Classical Guitar Centre Ltd is proud to be once more the main exhibitor at the Classical Guitar Festival of Great Britain at the lovely location of West Dean College near Chichester. It is always well-attended by guitar enthusiasts, teachers and performers and all are very welcome on the open day: Sunday the 18th of August. For further information please email or telephone us. Just in – our latest delivery of the superb ’130 Years’ model by Jose Ramirez. This instrument is turning out to be as hugely popular as its predecessor, the ’125 Years’ model. 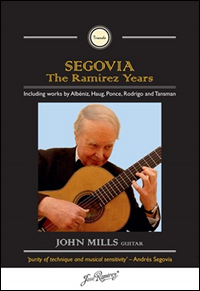 Both are of limited edition, designed in celebration of the landmark anniversaries of the House of Ramirez, Spain’s longest established guitar maker, which is commensurate with a skill and experience in lutherie that is truly peerless. 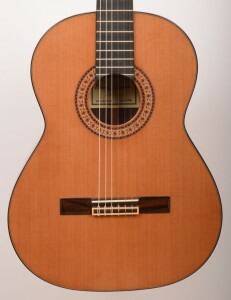 Constructed with all-solid woods, with a bone nut and saddle and available with either a spruce (pictured) or cedar top, this guitar is a wonderful showcase for the talents of its designer, the current head of the workshop, Amalia Ramirez. Comfortable to play and with excellent volume, it has the characteristically warm, golden ‘Ramirez’ tinge that seems to bleed into the tone colour of even the less expensive ‘Estudio’ ranges – from which this model is such an excellent example. See the website listing for further details of the ’130 Years’ in spruce or cedar. 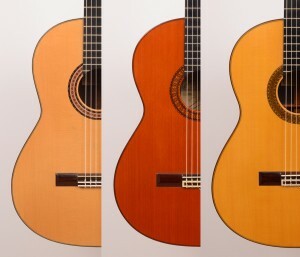 Welcome to The Classical Guitar Centre’s blog! Those of you that browse our website regularly will notice we are updating it over the coming few weeks with much better, up-to-date instrument photographs. There will also be the addition of some exciting new models – both second-hand and new! Stay tuned. The photo to the left is of the cocobolo back of one of them – Raimundo’s lovely new model 129. We have this in stock in a choice of either a spruce or cedar top. We are located centrally, four miles out from Birmingham's city centre and easily accessible via the motorway network (just three miles from junction three of the M5), rail (Birmingham New Street Station), or Birmingham Airport. Parking at the Centre is always available. Please telephone or email for any advice or assistance. 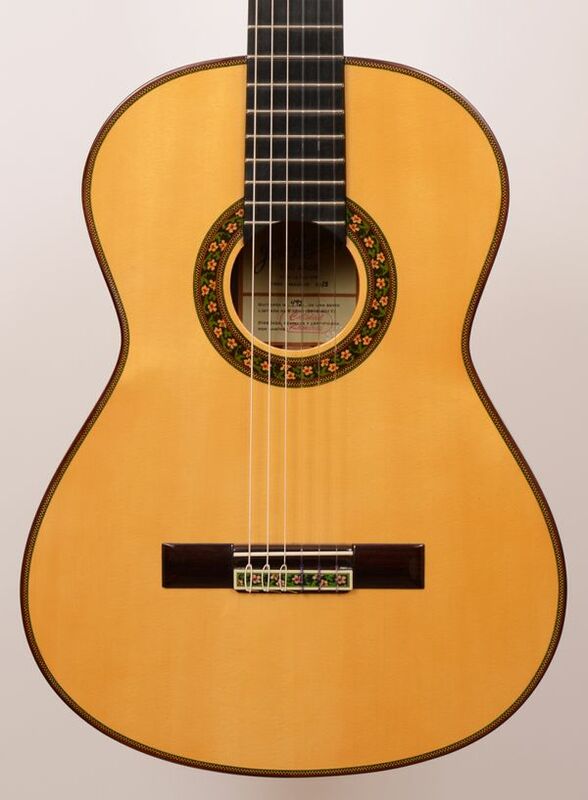 The Classical Guitar Centre Ltd, 51A St Mary's Road, Bearwood, West Midlands, B67 5DH, England. T: 0121 429 7446. ©2010 Classical Guitar Centre All rights reserved.